The need for a coordinated approach to respond in the event of a cyanide spill in Guyana was underscored when Aurora Gold Mine (AGM) hosted an emergency response seminar on Wednesday. The seminar, which brought together representatives from Government and non-government organisations such as the Guyana Police Force, Civil Defence Commission (CDC), the Guyana Fire Service and the Woodlands Hospital, was facilitated by Cyanco’s Director of Environment, Health, Safety and Security, Max Jones and Roy Norcross, Cyanco’s Director of Applied Technology and Quality Programmes. Cyanco International produces liquid sodium cyanide for the extraction of gold from its ore but in doing so it is big on safety, reliability and efficiency. AGM is among mining companies it supplies with sodium. During the initial stage of the seminar, Jones explained in depth the Incident Command System which was developed in the United States. It is a standardised on-scene incident management concept designed specifically to allow responders to adopt an integrated organisational structure equal to the complexity and demands of any single incident or multiple incidents without being hindered by jurisdictional boundaries. 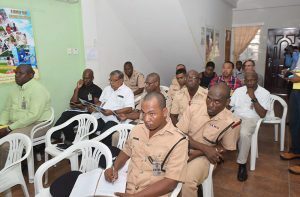 Subsequent to his presentation on the Incident Command System, Jones engaged the representatives, including CDC Director General, Colonel (ret’d) Chabilall Ramsarup and Divisional Commander in Charge of Operations at the Guyana Fire Service,Compton Sparman,on an emergency response exercise. It was while conducting that exercise that it was realised that there is no standard operating procedure to follow in response to a cyanide spill or an accident involving cyanide. Jones said there is an obvious need for “pre-planning”. “It is to come up with what if this happens, what if that happens and how do we react to that and how do we protect the public, how do we protect the environment and how do we recover what has been spilled so that it doesn’t have any further impact,” he said. AGM Health Safety and Environment Officer Clyde Gillespie told Guyana Chronicle that the seminar was very informative, noting that the mining company now has a better understanding of the way in which the communication should flow in the event of an accident involving cyanide. Gillespie said AGM has safety mechanisms in place to guard against cyanide spills, noting that the company has learnt from the mistakes made by Omai – the mining company responsible for the August 1995 cyanide spill in the Essequibo River. Additionally, there are established Standard Operating Procedures (SOPs) in the event of a cyanide spill. Sparman, who is knowledgable in the area of cyanide and cyanide spills, said there is need for a national coordinated response system to be in place. “This session is very important and we need to have more coordination on this as to who have the lead role or responsibility whenever you are dealing with this kind of spill,” he said. Based on the discussions during the seminar, it was agreed that there is need for another forum involving a wider scope of stakeholders. It was recommended too that the next seminar be conducted on site and allow for greater understanding of what needs to be done in the event of an accident.